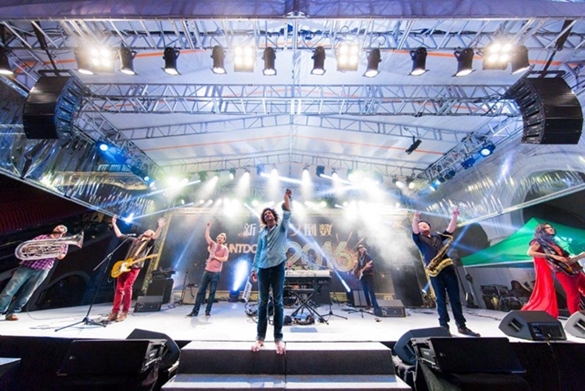 (Macao, Jan. 1, 2016) – Thousands of visitors descended on Sands Resorts Cotai Strip Macao on New Year’s Eve to enjoy live music and a spectacular admission-free New Year’s Eve countdown celebration at The Venetian Macao’s outdoor lagoon. Inside The Venetian Macao people were also celebrating. At the Cotai Arena Eason Chan celebrated the New Year with fans at his concert, while earlier in the day kids and their families enjoyed an early New Year countdown after a fantastic meal as part of King Julien's New Year's Eve Party with DreamWorks All-Stars at Sands Cotai Central. A party atmosphere was evident as revellers enjoyed the 3-D light and sound spectacular “Seasons of Wonder” and the simulated snowfall. The party atmosphere was turned up when the live entertainment got underway. Blue Note and Andy Frasco and the UN band provided the music while Colombian dancers and the spectacular fire gondola, which saw an acrobat thrill the crowd with a spectacular display on a gondola in the lagoon, wowed spectators in between music performances. 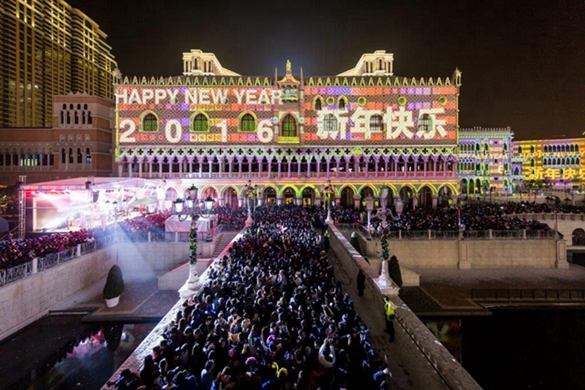 The free outdoor New Year’s Eve Countdown event wrapped up the evening by transforming the entire façade of The Venetian Macao into a countdown clock for the final 10 minutes of 2015 with a specially-edited projection and upbeat music. Anticipation grew as the countdown approached zero and reached a crescendo as the crowd counted down in unison for the final ten seconds of 2015. On the stroke of midnight a confetti drop covered the entire area as well as the crowd of revelers in a blanket of colourful confetti. Families and children enjoyed complimentary 2016 glasses as well as food and drinks, while other revellers opted for Champagne to see in the New Year. Inside The Venetian Macao there was more fun being had. 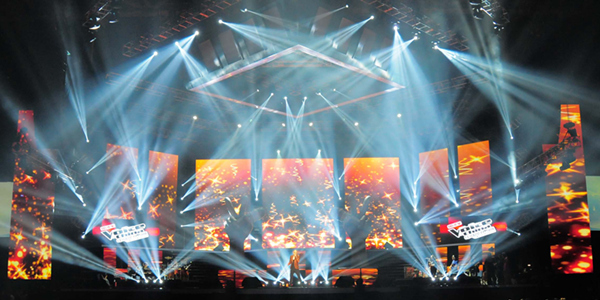 At the Cotai Arena, Cantopop superstar Eason Chan welcomed the New Year with his fans with a countdown during his second successive concert as part of Another Eason's LIFE in Macao. 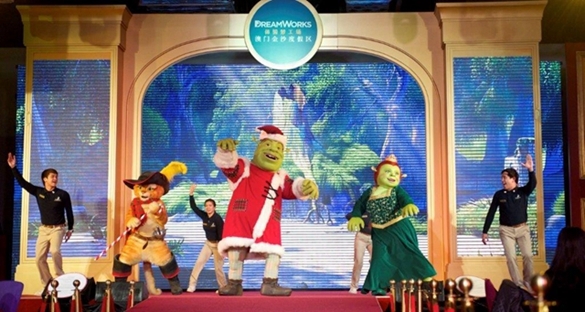 At Sands Cotai Central’s DreamWorks Experience, fans took part in a royal celebration with their favourite characters from “Madagascar,” ”Kung Fu Panda,” ”Shrek” and “How To Train Your Dragon” at King Julien's New Year's Eve Party with DreamWorks All-Stars. Attendees enjoyed delicious food, a high-energy musical performance and a meet and greet with their favourite characters. Everyone also took home a surprise gift after an early New Year’s Eve countdown. Photo caption: A huge crowd count down to the New Year in front of The Venetian Macao as innovative 3-D mapping technology turned the façade into a countdown clock on New Year’s Eve. 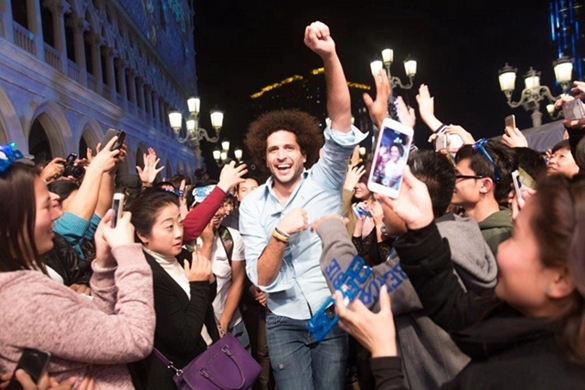 Photo caption: Andy Frasco and the UN band entertain the crowd at the spectacular admission-free New Year’s Eve countdown celebration at The Venetian Macao’s outdoor lagoon. 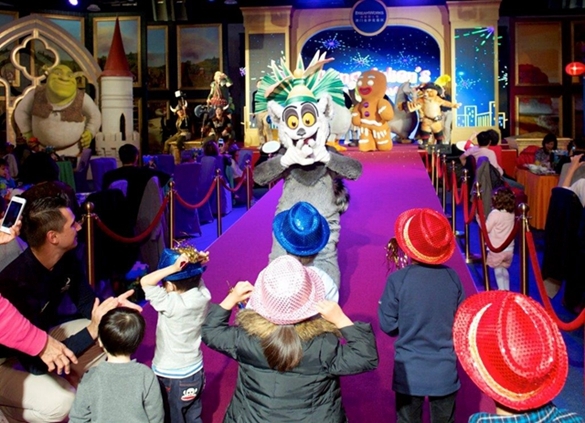 Photo caption: Families enjoy a feast as part of King Julien's New Year's Eve Party with DreamWorks All-Stars. The attendees later enjoyed an early New Year’s Eve countdown. 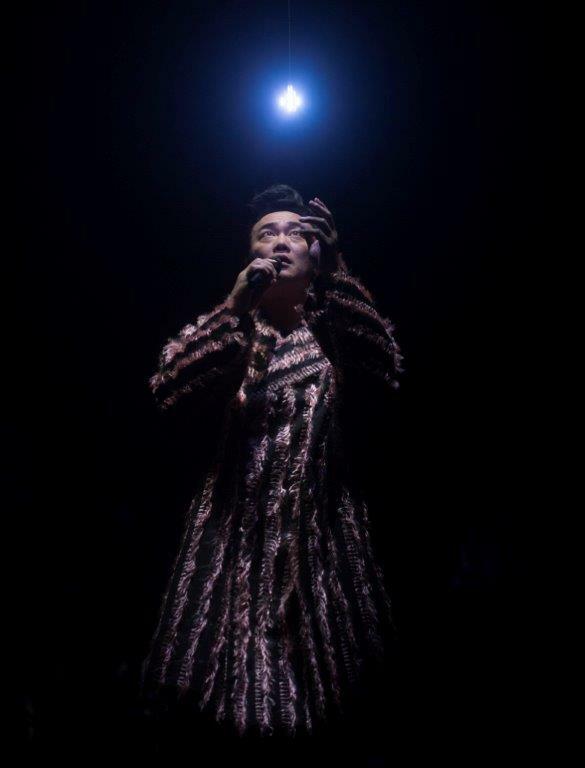 Photo caption: Eason Chan performs at the Cotai Arena as part of Another Eason's LIFE in Macao. He welcomed the New Year with his fans with a countdown at midnight. Pulsating with life, both night and day, Sands Resorts Cotai Strip Macao features an expansive offering of affordable luxury available nowhere else in Macao, with approximately 9,000 hotel rooms and suites, international superstar live entertainment, duty-free shopping with 600 retailers offering an unparalleled array of name brands, 1.3 million square feet (120,000 square metres) of meeting and exhibition space for Asia’s leading conferences and exhibitions, gaming excitement, transportation offerings and well over 100 dining options, including Michelin star restaurants, bars and lounges. Sands Resorts Cotai Strip Macao is a must-go destination providing every guest with an unforgettable experience and unparalleled excitement. Comprised of The Venetian® Macao; The Plaza™ Macao, featuring the Four Seasons Hotel Macao; and Sands® Cotai Central, featuring the world’s largest Conrad, Sheraton, and Holiday Inn hotels, Sands Resorts Cotai Strip Macao is where Asia’s ultimate destination is all within reach. And coming in late 2015... the crowning achievement of Sheldon G. Adelson’s vision of the Cotai Strip… The Parisian Macao. Sands Resorts Cotai Strip Macao….Be at the Centre of It All! For more information, please visit http://en.sandsresortsmacao.com.